Is your color copier/printer/scanner 2016 or newer? Click here for updated instructions. Time for a new copier? Request a free quote! *To view and Reset the Counts back to 0, see the instructions in blue at the bottom of the page. These are instructions for how to setup Sharp user control / account control in a Sharp copier. The end result of this procedure will require a code / user name and password to Copy, Print, Scan, or Fax. This procedure will show you how to activate user control, create authority groups, create users, view / manage the number of pages used by each user, and reset the counts for auditing purposes. 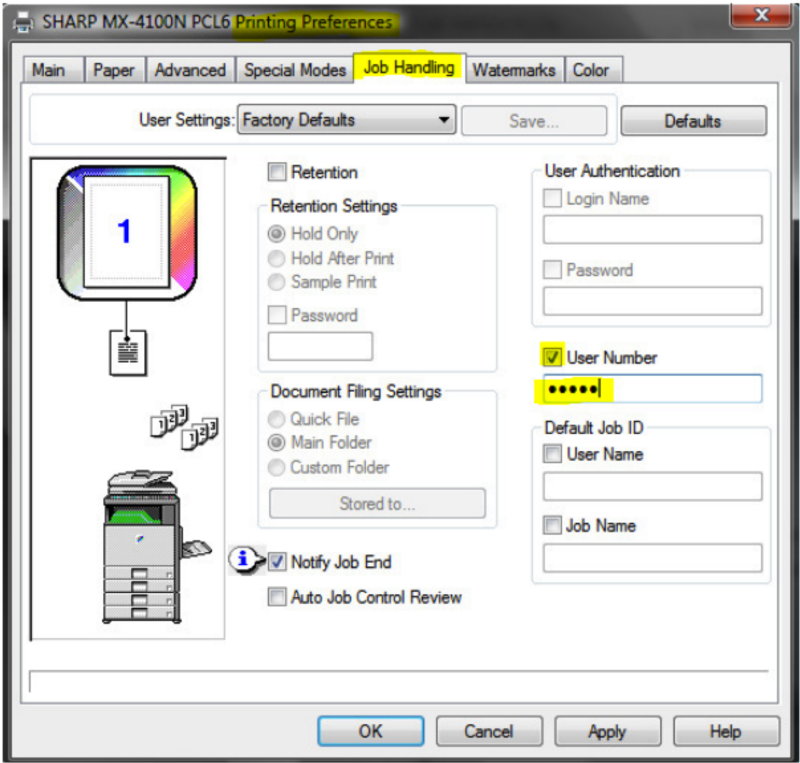 Once User Control is activated computers that currently print to the Sharp MFP will require a User Code in the print driver to resume printing activity. Once the Sharp MFP is on the network you can access the web page by typing the IP address of the machine into a web browser. The IP address can be obtained by printing a NIC page from the MFP touch-screen. Open a web browser and enter the IP address in the address bar, then click “User Control” on the left. The password by default is “admin” without the quotes. 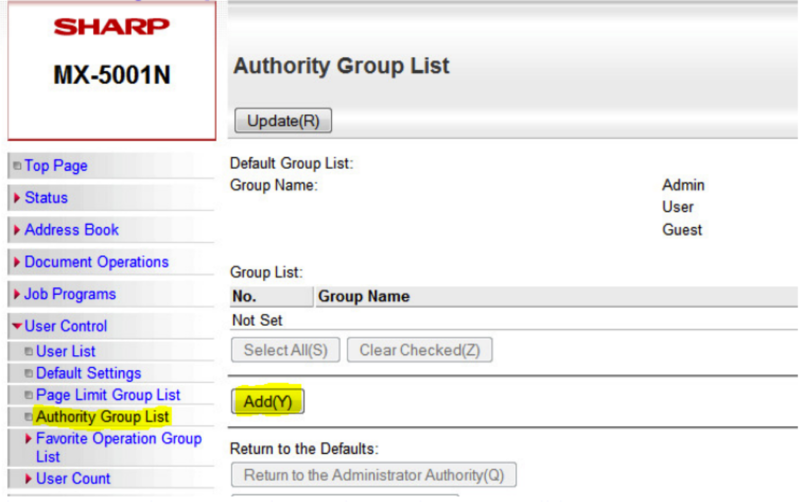 Click “Authority Group List” on the left, then click “Add.” These groups designate what authority the users will have. You can create several different authority groups depending on how much control you need over the users. Typically we create a group for users with access to only Black and White printing, and a group for users who will have access to both Color and Black and White. Once you have created your Authority Groups it is time to activate “User Control.” Click on “Default Settings” on the left menu. “Enable” user control, choose your authentication type(user number is recommended), and check the “Disable of Printing by Invalid Users” if you want only someone with a code to be able to print to the machine. “Submit” the settings. Once the Users have been created you must enter their code into the properties of their print driver so they can continue printing activity. 4. Go to the “Job Handling” tab, check “User Number” and enter the desired user’s code. At this point the users are ready to continue all activity on the Sharp MFPs with their code entered. This procedure is to View/Reset the User Codes from the web interface. 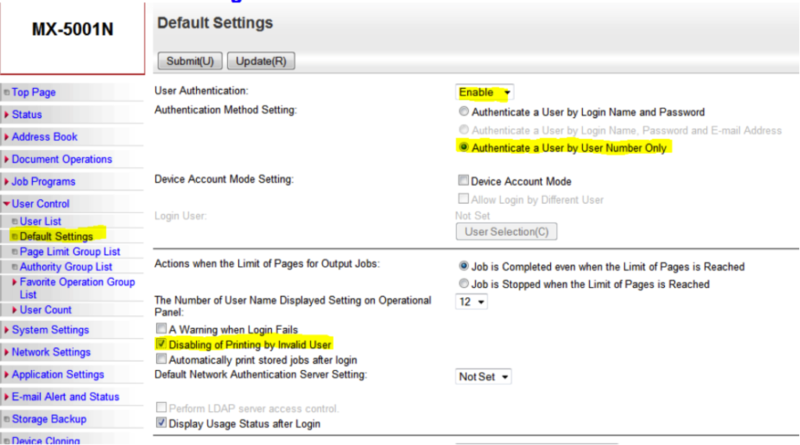 On the web interface, login as Administrator. Click “User Control” on the left menu. Click “User Count” on the left menu. Click “Save User Count” on the left menu. 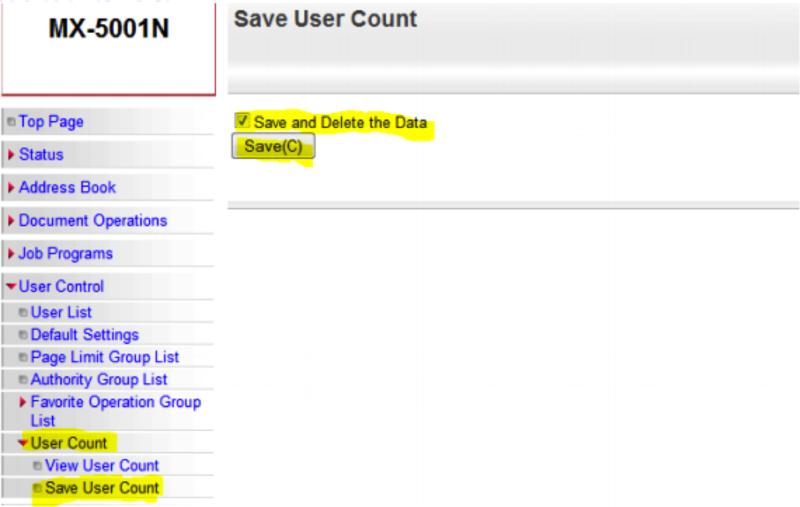 Check the “Save and Delete the Data” box and click “Save.” This will export the data into an Excel spreadsheet for viewing, and will also reset all of the counts for each code back to zero. Thank you for posting this video. If a user with this particular Sharp copier was trying to setup the user list in such a way where there print job only imitated after inputting a user name and password is that possible within the confines of the settings discussed above? Example: Sally has confidential papers she is trying to print of the networked sharp copier but doesn’t want it to sit on the copier for anyone to read before she can pick it up. Is there an option that when Sally gets there she can type in a user name and password and begin her print job? There sure is. Here is a quick video I made on how to release a user’s stored print jobs when they login at the panel of a Sharp copier. I just found your blog and am hoping you can answer a question for me that no one else seems to be able to answer! When I set up my user list (which are my clients), it was alphabetical. As I add new users (clients), they do not fall alphabetically, but rather at the end. It’s very frustrating! How do I have to enter the users so that they will appear alphabetically? Thank you. When looking at your user list on the web page, there are some arrows above the list you can click that re-arrange the list by alphabetical, reverse alphabetical, then the order you entered them. Hope that makes sense, and helps. Very helpful – thanks! If I use the arrows to put the list in alphabetical order and then save, do you know if my excel spreadsheet will appear in alphabetical order? In excel, highlight the column of client names and click the Sort and Filter button on the ribbon, then click Sort A to Z, it will ask you whether or not you want to expand the selection(choose to expand it), and it will alphabetize them for you and rearrange the numbers to line up with the names in the appropriate rows. Is there any way to release or delete jobs that were sent to the printer in secure mode, login and password required, when the end user doesn’t recall the password? Yes there is, the procedure is called a Document Filing Data Clear. Typically this is performed by a Sharp technician. Thanks for the video “How To Release Stored Jobs At Login ” does this instructional guide apply to the MX4111N? I have followed your instructions and unfortunately whenever I enable to “Authenticate a User by Login Name and Password ” and setup individual users and the custom folders the machine fails to print and no record of the print job can be located. Any ideas? Some models you have to use the User Name and password type authentication, some models work with either the Username and Password, or the User Number type. 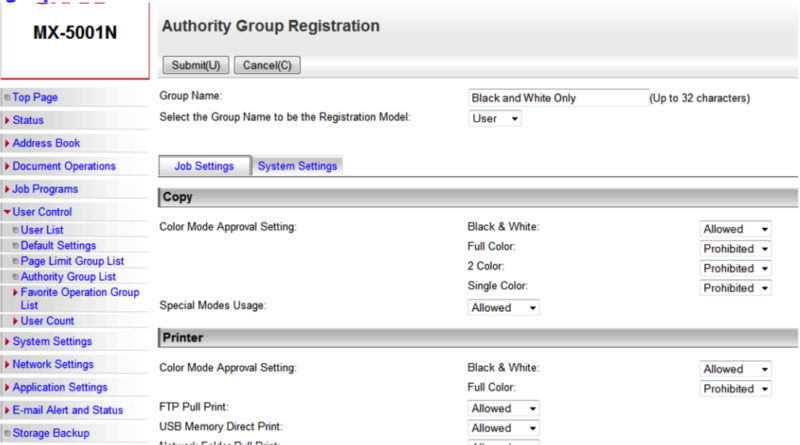 It also helps to make each user an administrator if you arent worried about them printing color. It sounds like maybe you aren’t doing the second half properly. The part where you setup the print driver to print to the custom folder. Hi,Thanks for the video.We need to count the No of pages printed by the individual users. Is it possible to do so.??? Yes, you just need to clear the counter each month(or however often you want) and follow the instructions at the end of this article to print/download the counts. I am very glad to know that how can we Setup Sharp User Control. I was searching from many days to get this information and finally your blog have been found. you have solved my biggest problem. Really really thanks for this great work. You’re welcome! Bookmark our site and request a quote from us next time you need a new copier! read the instructions in blue at the bottom of the post. Is it possible to setup a user to scan to email and Default it to a tiff image 200×200 in black and white only….just for one email address and leave the others as they are? The only one of those options that can be defaulted is the file format as TIFF. Beyond that you’d have to create a program to do what you want and add a button for it on the touch screen. It depends on what model you have since some cannot do this at all. We’d be happy to help for a small fee. Email cgrimes@sbesharp.com if you’re interested. I had follow the instruction written, but it still can print out directly without entering user number. It seem that it only not allow user to use scan or fax if not key in the correct user number, but for printing, user can print directly even without login. Any clue on this? Is this the correct behavior ? This should prevent people without a code from printing at all. We went to set up a code that allows only scanning to usb and email. Can we do this? i configured an Admin password on my sharp MX-M453N all in one Printer and it happened i forgot it, is there a way out to be able to reset my printer? now am stuck can’t print, can’t do scanning or make copy…… Please need your assistance! Perfect video and it did helped me to configure it. But i have a question. Now user with color rights can print in color but i want default to be Black and White. I did change that in Windows 7 Devices and Printer- Printer preferences->Color settings. Now when user opens a document in Word or any apps, it defaults as print in Black and White and if he want to print in color, he Has to make changes in preferences to print color. Now if the word is open and he want to print another document it will be print in color since the change made by user. If you close and reopen the word that’s fine it will print in BW. so apps dose not refresh print properties. Hope i make sense here but is there a way to force change since this seems to be by design and to print it in BW only. Is there a video somewhere showing how to set up the authentication for Mac OS X 10.10. I have found some instructional links around on the internet but they seem to only go up to 10.9 and after downloading the appropriate driver from Sharp for my MX-3610N, the menu item for Job Handling does not appear in the selections when you open a print dialog and click on the menu where it is supposed to be based on my review of the instructions for 10.9 found on the web. Yessir. If you go to the Print Drivers page there is a video on how to download and install the print drivers for Mac, including entering the user control/authentication code. Is there a way to configure the Sharp with a keypad on the display? Authentication would be for the user that walks up to the unit and keys in the numbers to copy. I bought a printer sharp but is locked to black and white only printing if I try colour printing or copying it says I got no authority. How can I fix this. I’d start with disabling user control and re-setting it up using the instructions on this page. If you wanted to have the user numbers in the report you’d have to enter them in the User name, along with the user name. It’s meant to be a password so it doesn’t show. You’d have a username like “Sally Smith – 12345” and then enter 12345 for her code. Is there away to have the scan to email set the sender’s name as the user who put their code in. My old savin would send from whoever entered their code to outside email addresses, so anyone replying would get that sender directly. I have a real estate office, and agents will just come in with paperwork to scan to a client directly rather than having to set up their laptops to receive the file and send it manually. I cannot find the setting to enable this. Everything is sending from only 1 default email address. Please help. In the user control settings there is a space for the user’s email address on most Sharp models. I believe when you populate this field with the user’s email it will use their email address as the reply-to email address. Alternatively, you can setup Sender Addresses in the web page as well. It’s highly recommended to scan to yourself and forward it. Smart phones can forward messages with attachments. I have charged the wrong code / billed the wrong client for the user count. Is it possible to change the user count so I can remove it from the wrongly charged code and adjust the correct one? unfortunately not…you can just manually run the report and subtract the mistaken prints from the count before billing and resetting the counts to zero. Good day Admin. I was searching for how to configure a normal computer hard drive to work with a newly bought mx4501n when I came across ur site. Pls, can u be of help to me? Follow along with the video on this page! Hi, I’m on the way to move from Notebook “A” to Notebook “B” and the new one is completly new. Installed the Sharp MX-2301 fully, but don’t know the User number saved in PC “A”. As IT is not available now, could someone instruct me where can I find the stored User Number in Registry? Without this I can’t print with my new notebook. The numbers are hidden characters like a password on your computer. Once it’s in there you cannot see it. Most people who utilize the User Control keep a reference of codes/users. Your best bet is to setup a new user in the web interface and give it a number you can use in the future. The instructions on this page should help you through that process! Hello. We have various user numbers set up on our copier but whenever I print off a report of the user counts, a lot of copies always go under the generic ‘other user’ account, which I don’t want. Any ideas whey this keeps happening? Some models will allow B&W prints to come out without a code attached. Make sure all of your users have their code entered in their print driver, or check the box that says “disable printing for invalid users” (or something along those lines) in the web interface on the User Control > Defaults Settings page. We use MX-M62en. We want to bill our clients for copies/prints we do on their jobs. We set up numbered accounts but it is a big delay, to login and then have to enter a 5 digit user # ea time. Our older Canon was way easier. What is the simplest way to track the prints we do for our clients? At any one time, we may only have 10 or 20 to track. If you followed the procedure here you should only have to enter your 5 digit code and hit OK and it will let you in. You shouldnt have to login with a username/password and then enter a 5 digit code. Thanks. Yes, we did figure that out. However, at least on our M623N, as we switch back and forth between clients frequently and so we have to open printer preferences, then open job handling and then change the user number. Whereas with Canon everytime we print (Control P) the user acc box automatically pops up and we just enter the acct # and press print. Also on the Sharp to enter new user accounts IT ALWAYS goes back to number 50 -40and down and to enter such as a new acc # 8, we have to back select previous a number of times to get to acct ranges that include #8 Then as soon as that is saved, it goes back to 50-40 and again and again we have to then press previous a number of times to get to 1-10. Maybe this Sharp has problems? or is the above “normal” for Sharp, THANKS for your assist!!! Oh I misunderstood your question. If you check the “auto job control review” box on the Job Handling tab it will launch the box asking for your number each time you print something. There is a checkbox on that page that says “use this code every time” or something to that effect. If you’re using a different client code each time just leave the code box blank, check the “auto job control review” on the job handling tab and apply those settings. I think that’s the answer you’re looking for. Oh great news! Thanks again!!! Great video and readme thanks. Do you have any advise on setting the Sharp MX-2614N up to login automatically to mono and then request a pin to go to colour mode. I have seen this before on a Sharp but don’t understand how to set it up. We have a Sharp MX-M363N. I’m trying to enter in one of salespersons email address to be able to scan documents. I know how to enter it, but when I enter the email address won’t include the .com part. Is there a limit to the amount of characters it will hold? There are 36 characters (including the @ and . com etc.). To be honest I’m not sure…There should be a note next to the box on the form if there’s a limit. I haven’t encountered this problem before. Hi, each department has user codes so they can have access to printing, copying etc. I have to send in month meter readings. I login to the web interface and export the data for the current month. However, I’ve misplaced one set of spreadsheets that I desperately need. Is there a way of me to retrieve the document? I’m afraid not. The machine does not archive that information. Great video! I have users with the option “Hold Only” and with a PIN. However sometimes they have to send several jobs at the same time and when they go to the printer they can only select one job at a time and enter the PIN for each one. Is there a way to allow the users to select multiple jobs from the printer (with their user ID’s, obviously) and then enter the PIN only once? Is there a way to automatically collect the job logs from like 5-6 MFPs in the network and combine it into one Excel + clear the job log counter? If it could run in a schedule it would be better. If Sharp had anything like that it would be the Sharp Remote Device manager, but I don’t believe it has that capability. For functionality like that you’re looking at 3rd party solutions like Drivve or PaperCut. On a Sharp MX-3070, is there a way to set Job Handling => Hold Only to affect only my print jobs? If I set this and put in a PIN Code on my Windows 7 client computer, it changes it globally for all users using that printer from the print server. In your printers menu in the control panel right click the Sharp and choose Printing Preferences. The preferences are local to your computer, the Properties area will affect everyone. Hello, We use RDP connections from Thin Clients to connect our users to their remote desktops. The users then have access to a shared networked Sharp MX2640. Is ther any way that we can configure the printer to hold users jobs until they physically visit the printer and enter their credentials. Hi, really good infos, nice job. We have a new MX3070 installation and need to enter at least 70 users. As far as you know, is it possible to do it by a Software through a PC or a CSV/TXT to be imported into machine? Unfortunately not, there is no way to bulk import users at this time. You can bulk import Email Address into the address book, but that’s different. We’d like to implement user control to get a count of how many pages are printed by each user. Is it possible to ONLY implement the user control for printing and not for scanning so the user does not need to enter their user number at the device when scanning to email? You can create a general user and have the machine stay logged into it at all times. Under user control > default settings, check the Device Account Mode box, then Allow Login by Different User, then click user selection. Check the user you want, enter their code, click verify(or something similar, I’m going from memory here) then click Ok, then click submit. This will make the machine stay logged into this user at all times, but your users will still have to enter a code(or have a code embedded in their driver) to print. Excellent – thank you so much that worked a treat !.. IN OUR COMPANY WE ARE USING SHARP MX264N PRINTER. I NEED A GUIDANCE TO RESTRICT THE WASTAGE PRINTOUT. THE QUESTION IS THE PRINTER SHOULD ASK FOR A PASSWORD AFTER I GAVE PRINT FROM MY SYSTEM(SHOULD BE APPLICABLE FOR ALL USERS).WITHOUT ENTERING THE PASSWORD IN THE PRINTER, PRINT OUT SHOULD NOT COMES OUT. IS IT POSSIBLE. KINDLY CLARIFY. This will have the print driver prompt the users for a code every time they print something. The code can be changed on the fly, or you can check a box that says “Always use this code” and the driver will store that code. I’m using a Sharp MX2616N. when using the job handling in print driver and select “hold” and “hold only” for some users in the office it works fine, go to printer, login and it shows file under main menu. for other users the file does not show on the printer display; however, the files are visible in “document filing” on the website, they can be selected and printed from there. Why are those files not making it to the printer for some users? All using the same print driver and Windows 10 pro. Thank you. Are you using any sort of user control? I can’t think of any clear-cut reason for the jobs to behave this way. We are using User Control and I just discovered that to show up in the “Main” folder the user setting towards the bottom of the User set up screen has to be set to “Admin” and not just “User”. Now the function is working properly. That was my thought – glad you got it figured out. Hi, please, could you tell me if its possible to set up black print with blank user number and color with some user number. How does it affect users with not blank user number when i remove it? Thank you for reply. There’s a checkbox in the user control that says “disabling of printing by invalid user.” If this is unchecked it should allow B&W prints to come through without a code attached to them. You’ll have to make sure the default the print driver to B&W, or just use a B&W model driver rather than the color driver. Color prints will require a code. The password can be reset by a local Sharp dealer. This is not information we give out to the public for security reasons. Click the link below to find a dealer near you. I scan hundreds of files per day sometimes. I would like it to keep my name in the que and let me just put in my next scan with out having to press address, find my name and his send each and every time. Can that be done. Yes, but your Sharp dealer will likely need to make these changes for you since the setting is hidden in the service menu. Why is our printer (at my office) cant print from thumb drive? And there is no document filing on the screen.. is that “document filing” need ti install? There might be a button called Scan to HDD or something similar. If you do not have the button you can edit the home screen by using the admin password, admin, and add a button that says Print from External Memory. The file types you’ll be able to print depends on whether or not your model has Post Script installed. Our model printer is Sharp MX2010u. And there is no button scan to HDD or similar like that.. or i dont know.. hehe..
I’m sorry but I’m not familiar with that model. If you are trying to scan to a USB this might work. I print for a number of advisors. How do I setup my printer to request a login in for each print. 4. Check the “Auto Job Control Review” box. Now every time you print it will launch a dialog box where you can enter a different code each time. We have a Sharp MX-4111N. Is there a way, from the web interface, to default ALL users to B & W so they have to actually change the option to color manually for each print from PC? I have about 100 users to manage. I would have to go to each end user, change the driver on their PC, and then monitor and change if they change it to color again. They are PERMITTED to use color I just want them to have to think about it first. Yes, if your driver is shared from the server you can go to Printers Menu, right click Sharp, click Printer Properties. Go to Advanced Tab, click Printing Defaults button. Then check the “Black and White Print” box. These settings will push down to the workstations that are connected to this queue and everyone should be defaulted to print B&W. Thank you for the response. Unfortunately it is not. We had problems operating from the print server initially so we install manually. In that case you’ll have to do the same steps, but on each computer under the Printing Preferences. We have our Sharp MX-5141 set up so that it is always logged onto a generic login so anyone can still copy/scan/fax items. But then I have logins created for our HR and Finance team so that each individual when they send a print job it sits there until they log in to print it. Our problem now is faxes. Both departments receive faxes but they print automatically. HR doesn’t need to be seeing our Finance faxes and we don’t need to see HR’s faxes, but we also don’t like confidential information like that just sitting at the printer. Is there an easy way to prevent the fax from auto printing and instead only printing when the individual logs in? How could we even direct an incoming fax to the correct individual? Or is there a way the faxes could be put into a file upon receiving and we can just periodically check the file and print something if it looks like it could be ours? We’re not sure how to go about preventing faxes from automatically printing.